February is a relatively quiet time for lawn care but the grass is going through a change with parts dying back as it grows. This may result in spongy areas, with moss and weed taking over. Keep aerating the lawn and, as soon as you can, scarify. You may need to wait until March or later to do this if conditions are harsh or very wet. 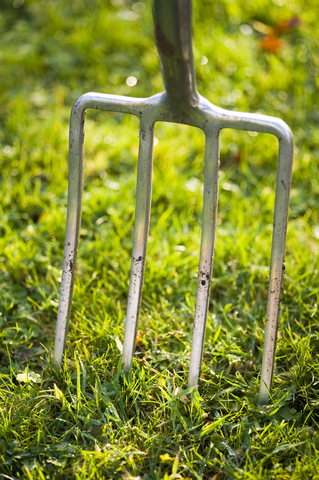 Meanwhile you can carry on using a garden fork or a towed aerator to get air to the roots and improve drainage. Don’t feed the grass over the winter; fertiliser can promote premature growth that the weather conditions can easily kill off. Wait until spring to feed. What you can do is think about top dressing, a process that many professionals carry out at the end of the winter and when the grass starts back into growth. This is interesting. Is there a monthly subscription for that? Hi Vanessa, please sign-up to our free monthly newsletter. The sign-up panel is on the right-hand side of the screen.